I am curious as to whether or not charged off debt can continue to accrue interest. I was always told “no” but today an attorney for one of those “third party collectors” told me “yes.” I had already paid $900 into the charged-off debt and then that collector dropped us after I confronted them about some shady practices. They withdrew funds without my authorization and a new law firm picked it up and tacked on another $1500 above what I’d already paid! The first law firm didn’t charge interest, but this one is. Any information you can offer would be most appreciated! What is a charged-off debt and how does it affect your credit? Sounds like Jennifer is in a tough spot. To make the best of the situation, she’s going to need to learn a little about what a “charge-off” really is, how collections work and whether the lender can charge interest on the debt. When Jennifer borrowed money from a company, she created an expectation of future income when the debt was repaid. That’s an asset of the corporation. When a company “charges-off” a loan, they’re saying that they don’t believe that they’ll ever be able to collect the debt. So they “write-off” the asset. It’s an accounting entry that reduces their profits and taxes. They’ll also report the charge-off to the credit rating agencies. That makes it more difficult for Jennifer to borrow money later. An overdue debt can be shown on your credit report for 7 years after the account became delinquent. But, that’s just the accounting aspect. What happens to the debt in the “real” world? Just because a debt has been charged-off does not mean that Jennifer still doesn’t owe the money (plus interest and penalties). What she owes depends on the original loan agreement, state law concerning the Statute of Limitations (SoL) and the federal law governing collections. The original terms from the loan still apply. All that fine print that no one reads becomes important now. Generally, it gives the lender quite a bit of latitude to charge interest and penalties. What is the Statute of Limitations on a debt? Next Jennifer needs to find out the statute of limitations (SoL) on her debt. In most cases, it’s between 3 and 6 years. State law and the type of debt will determine the SoL. The SoL says that after a certain period of time that the debtor is no longer legally required to pay a debt. There are actions that Jennifer could take that would restart the clock on the SoL. Making a payment, signing an agreement to pay or even admitting that the debt is valid could be enough to stop or reset the SoL clock to zero. She’ll need to do a little research to learn the SoL in her state. She should be able to find the number for the state’s information operator with a simple internet search. They should be able to point her to the state agency that can explain the law. Two notes about SoL. Even though the SoL says that a debt doesn’t have to be repaid, it’s not illegal to attempt to collect it. And, if the lender gets a judgement against the borrower, there’s no SoL on the judgement. Jennifer also needs to know a little bit about collection agencies. Some work for a percentage of any money that they’re able to collect. Others buy a group of bad loans for pennies on the dollar. Then they keep everything collected. Since they own the loan, they’re also allowed to re-sell it to another collection agency. That could explain why Jennifer has heard from more than one agency. They’re also sometimes affiliated with law firms so that they sound more important. Whoever owns the loan, original lender or collection agency, is allowed to keep charging interest and penalties per the original loan agreement and applicable laws. Anyone trying to collect the loan is supposed to obey the federal Fair Debt Collection Practices Act. But, as you’d expect, some will bend or even break the collection rules. It’s no surprise that they tapped into Jennifer’s bank account. She might have given permission without realizing it. They will also try to garnish her wages or put a lien against any property that she owns. There are, however, laws that keep them from just taking anything they find. Once a debt has been reported as written-off, paying it will not wipe away the bad comment in her credit report. It will look better, but only slightly. It’s possible that the original lender may agree to remove the item if a partial payment is made. But, only the original lender may do that. Not an outside collection agency. Hopefully, Jennifer will be able to close this unfortunate episode and never have to revisit the issue again. Gary Foreman is a former financial planner and purchasing manager who founded The Dollar Stretcher.com website and newsletters in 1996. 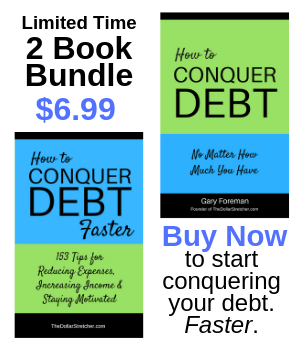 He's the author of How to Conquer Debt No Matter How Much You Have and he's been featured in MSN Money, Yahoo Finance, Fox Business, The Nightly Business Report, US News Money, Credit.com and CreditCards.com. Gary shares his philosophy of money here. Gary is available for audio, video or print interviews. For more info see his media page.